Crowdsourcing Answers to: What Is Your Reason For Not Sharing As An Educator? From the moment in my first year of teaching, when a colleague told me that she thought I was bragging when I was sharing my work, I have been stumped that “sharing” among educators was not something given, not inherent to a… well… a teacher… I have written many blog posts from It’s All About Sharing & Collaborating, There is a responsibility of sharing among Educators, Sharing in Education- Is it Changing? to What Do You Have to Lose? I do want to understand WHY some educators choose to not share. I want to understand their point of view… I chose to crowdsource answers to that question. 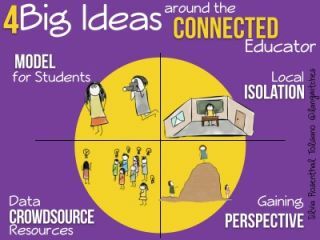 I consider crowdsourcing as one of the transformative big ideas around being a connected educator. Taking advantage of Mix by FiftyThree, a new platform for Sketchnoting, I uploaded the following image below with the question: As an Educator, What is YOUR Reason for NOT sharing? Once uploaded to Mix, the sketch is visible to other members of the Mix network. Members can choose to star the sketch, then open it on their iPad Paper app and remix it, which then gets shared back to the platform. Looking at the responses, I am gaining answers from the different perspectives I was looking for. Chris shared his reasons “being judged as a teacher’s pet”, “I’m shy”, “I have no self-confidence” and “people whisper about me”. Mika is being held back from sharing, because of judgement, expectations, fear and feeling that she is not being smart. Brandon, changed the variable from “educator” to “creator” and lists as his reason holding him back from sharing as: fear, doubt, shame, etc. Levi adds to general fear, his handwriting, spelling errors and “having no imagination” to the reasons holding him back from sharing. Thank you for “sharing” your reasons why educators might not “share”. It is painting a bigger picture for me, beyond my own perspective. I am amazed a the crowdsourcing capabilities of the Mix platform. Beyond that, the thinking behind creating a slide/image that invites others to add their perspective, their creativity to “the mix” is complex. I am trying to learn from other images that have inspired hundreds of remixes. What sparks inspiration to add in some, but not in others? How can I make the “variables” (the ones I want others to remix/add to) more obvious? In the above example, I would have liked others, in addition to adding their reasons, to change my signature “@langwitches” with their own Twitter handle and ( as Brandon did) change “educator” for another noun (ex. As a Creator). Just as we help our students “write for an audience”, how do we teach and learn to “draw and/or write for a crowd”?